UPDATE: Tickets are now available for purchase at Nixor College! Check your facebook inbox for details. A play about a play! Noises Off, Michael Frayn’s Tony award winning, comic masterpiece is not one play, but two. Slamming doors, flying props, prat falls, sardines and two-story revolving sets abound as we see the first act of Nothing On presented three times, once in each act of Noises Off. The first time, it is midnight at the final dress rehearsal and the company is struggling to get the drastically under-rehearsed show ready. Second time, Act Two, its one month later, and again we see Act One of Nothing On but this time from backstage. By the third time, we are at the end of Nothing On’s twelve-week touring run and witnessing the action from the front again. With set mishaps and the actors seeking revenge upon each other, the more they work to control the situation the funnier and more out of control it gets. 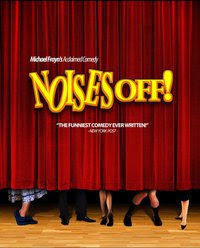 Noises Off speaks to what we love about theatre and makes us laugh at our dramas, both onstage and off. Free Icecream being provided by Walls, Unilever! Profit will be donated to one of the Nixor charities.